Hello ... Hello ... my old friends ... It's great to see you once again! 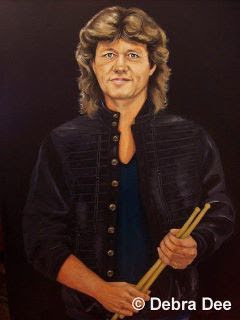 Debra Dee is a fantastic Australian artiste who has produced this excellent portrait of our very own Bev Bevan - co-founder [of course] of The Move, ELO and ELO Part II. And "Here Is The News" folks: Debra has given me permission to publish this ELOBF article because the Bev Bevan portrait shown below is now available to purchase either as a limited edition 24" x 18" print on canvas or as an A4 sized print on quality cardboard. Furthermore, the 24" x 18" print is limited to just 50 pieces and comes with a Certificate of Authenticity. The larger print is priced at £250 or $500 [US/Aus][plus P+P] and the A4 print is attractively priced at £25 or $50 [US/Aus][plus P+P]. Debra is also planning further projects involving members of that classic ELO line-up. Yours Truly KJS and ELO Beatles Forever [ELOBF] are proud to support the artistry of Debra Dee.